About 1 week ago I moved my 2 children into the same bedroom. That left me with an empty room to finally have my own space for sewing. Right now my sewing room is a mess as I try to reorganize everything and get new furniture in there. Not knowing exactly where to start my mission, I started in my presser foot box. It was just one of those small Rubbermaid type of bins with a lid, about the size of a small box. It starts out with just presser feet in the container but by the end of the month I've got pins, scissors, thread and what not in the box. Plus I always spend 5 minutes searching for the right foot. I had seen a "sewing supply bag" on the Sears website for $30, but I have never actually seen it in the store and looks rather bulky to me. I really like the way the pockets are clear. That's about the only thing I like, so I decided to make my own. 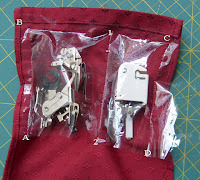 Here are general instructions for making your own presser foot/accessory organizer. Enjoy! You will need fabric and some vinyl. I used one of those bags you get when you purchase a comforter. for fabric I used some upholstery fabric I had lying around. Step 1: Lay out all of your presser feet/accessories you want to put in the organizer. Group them by size. Step 3: Cut out pieces of the vinyl larger than the size you need, you can always trim it later. Starting at the bottom (with your largest pieces) sew the plastic on. 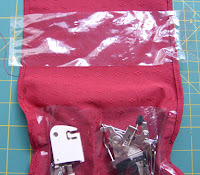 Then sew channels to form more pockets. 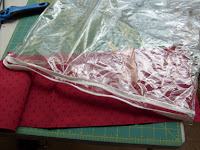 Pin the plastic often and sew slowly to avoid puckers. Step 4: Sew the rest of your rows. Make sure you fill the previous row with your presser feet before you determine where to place the next row. This way you can tell how far away to stitch your next row with out having puckers. Finish it off anyway you want! You can add grommets to the top so you can hang it on your wall, add a magnetic clasp so it stays shut (this is what I plan to do) or tie it with a ribbon. This conveniently fold to about 5"x7" Mine is about 2" thick. 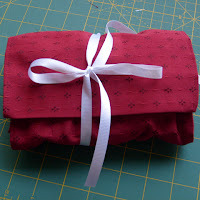 Tuck this baby in with your sewing bag and you're ready for your next class! That is very cool! I love how you showed how you made it and the pics. Awesome idea and it would be great for lots of notions and stuff. I've been using it every day since I made it! It has held up very well and keeps my workshop neat and tidy!